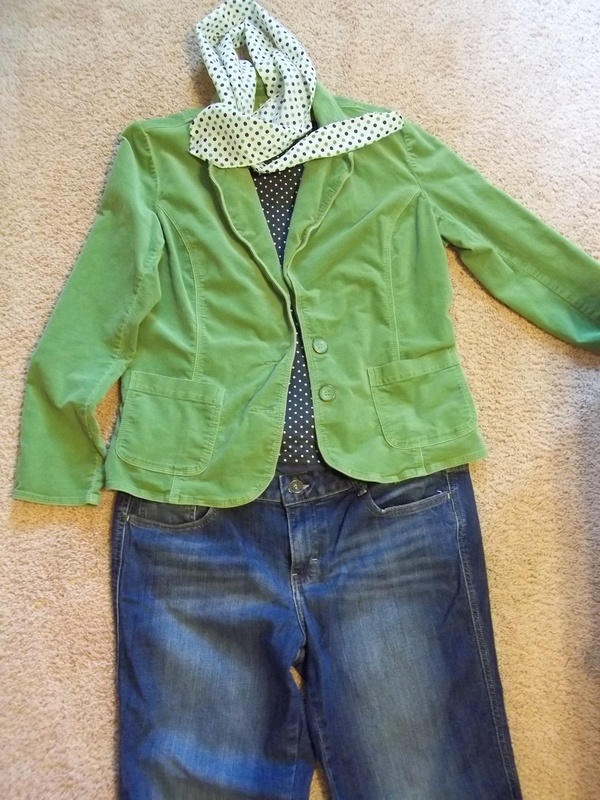 I love putting together outfits from thrift stores. Thrift shopping makes my heart go pitter patter and is actually stress relieving for me. Oh, and scouring the clearance rack at a regular store and finding something cute for a really good deal–that makes me smile too. It’s like the fun of shopping without emptying your wallet in the process. Today I am sharing some of my personal favorite thrifted and/or clearance outfits, along with some tips for clothes shopping at a thrift store. This is one of my favorite thrifted outfits. A great pair of jeans (Calvin Klein on a rack with $1 items? Yes please. 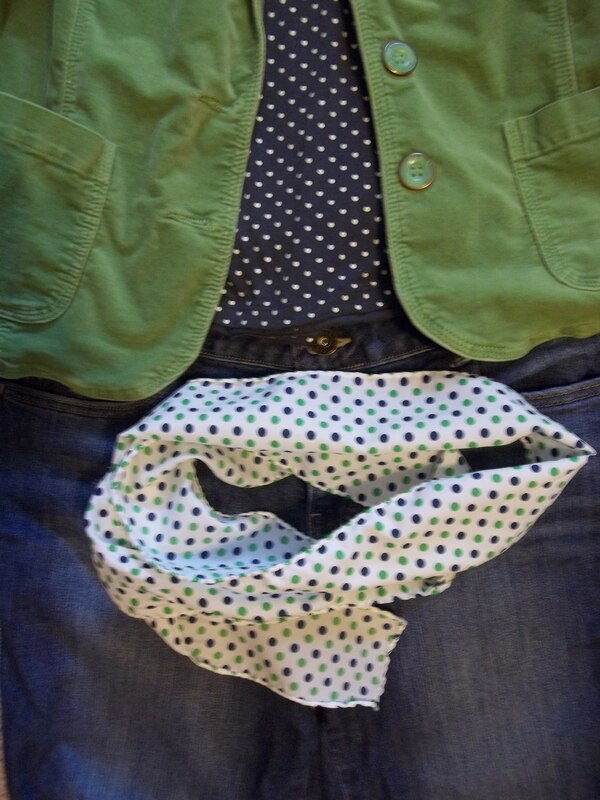 ), a $2 Target clearance tank, a $2 Goodwill Bargain Room jacket, and a 50 cent scarf. 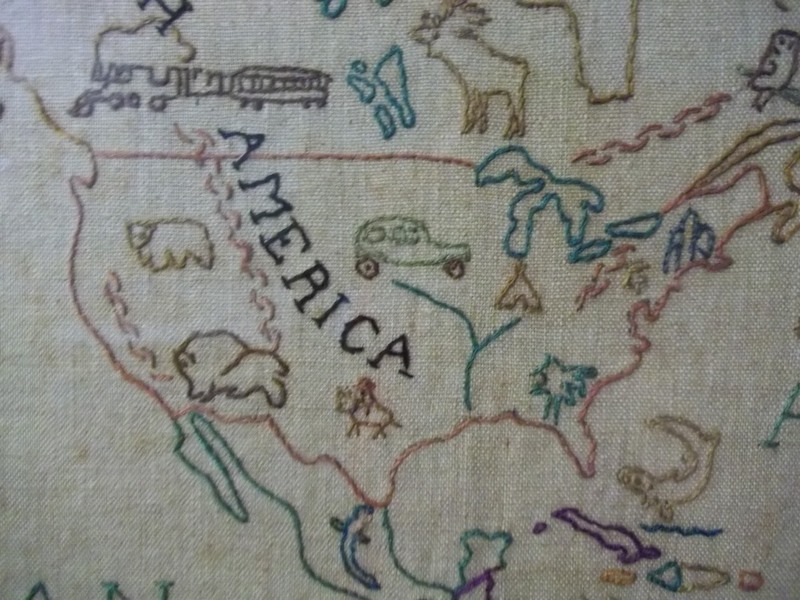 A close-up of all the pieces shows how I tied the colors together, along with the polka dots. An outfit for this summer. 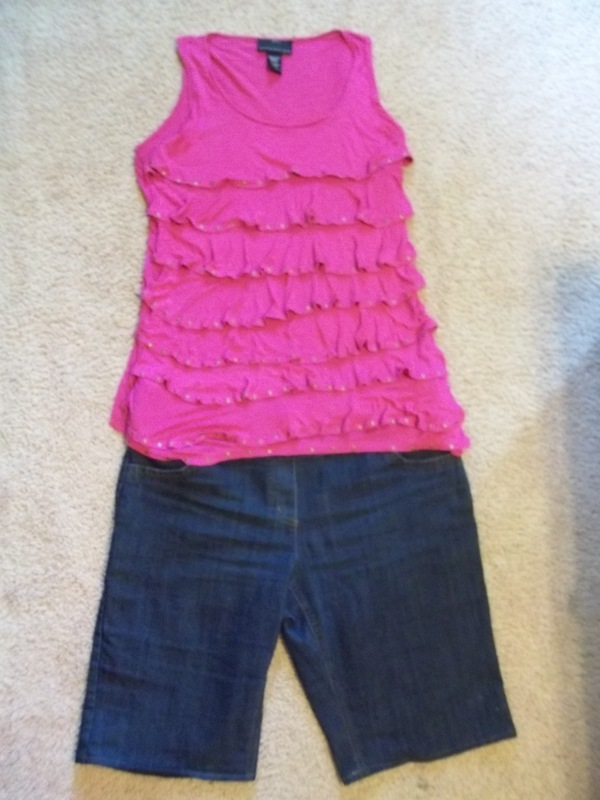 I couldn’t resist this pink ruffled tank top when I spotted it at Goodwill. 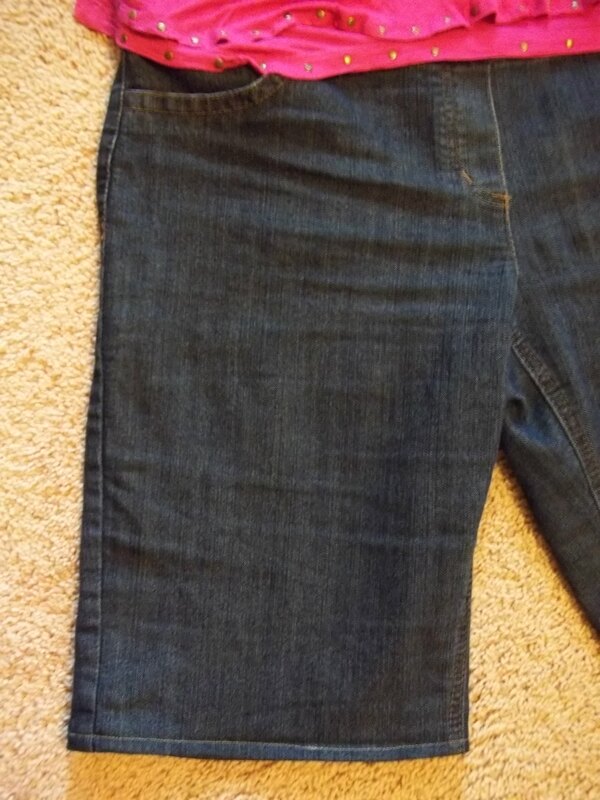 The dark denim shorts were actually a $3 pair of jeans that fit me well, but had only a 29″ inseam. That length does NOT work for this tall mama, so I bought the jeans, took them home, and cut and hemmed them into shorts that are a good length for me. I’ve worn them paired up with lots of other things since then. This is also an outfit I’ve been wearing this summer. The skirt was yet another Goodwill find (I think about $5) and the white tank was on clearance from llbean.com for something like $2. 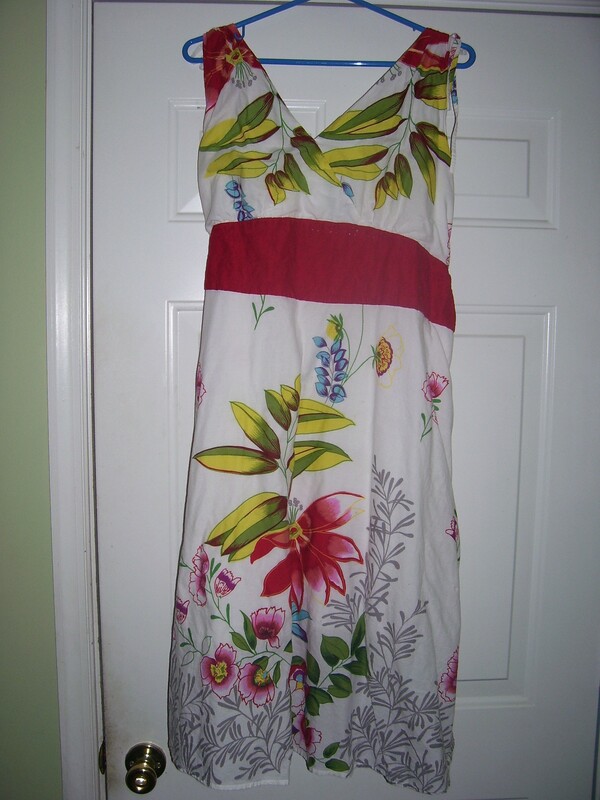 This picture is from last year, but it’s a handmade dress I discovered at Goodwill for $5. The red band around the waist area is actually a pretty eyelet lace that I think makes the outfit. 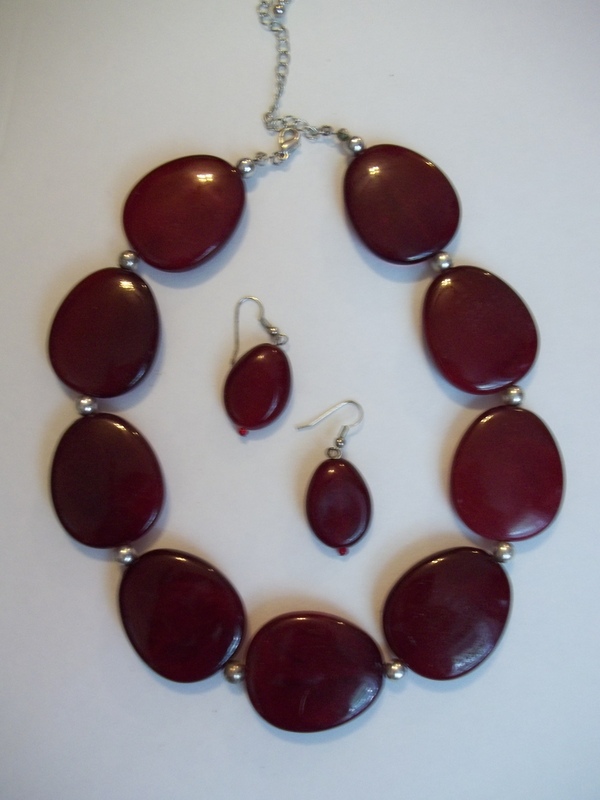 I usually pair the dress up with this $1 earring/necklace set I happened upon at a yard sale. They’re a little bit lighter red in person, so they set off the red in the dress well. 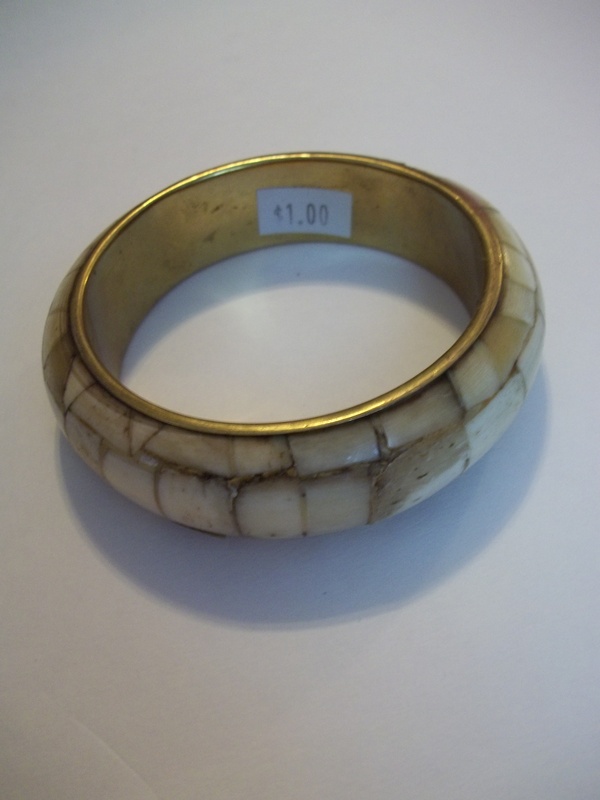 Speaking of accessories, this bangle was a recent $1 find. 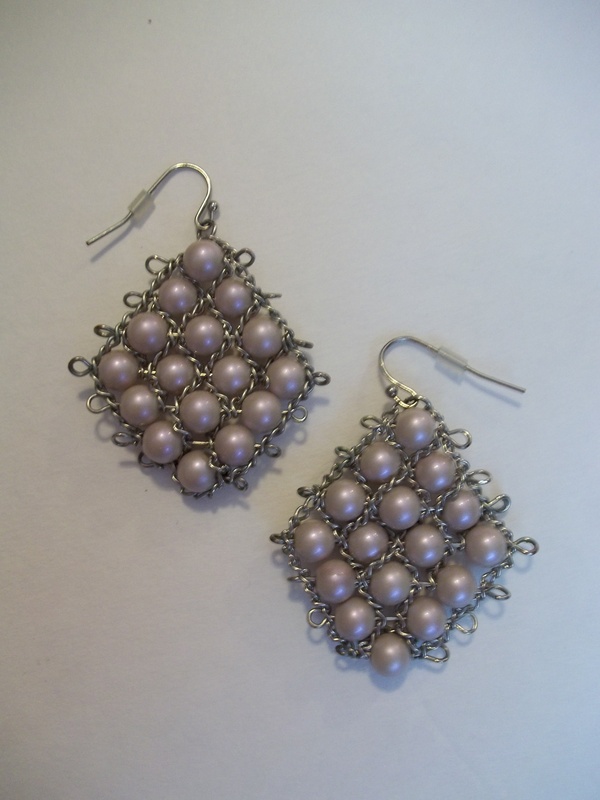 These earrings have been worn by me scores of times already this summer. I love them because they match a lot of things I already have. They were found at Kohl’s on clearance. So, now that I’ve shared a few of my favorite outfits, I compiled a list of shopping tips if you’re headed out to a thrift store to look for clothing. -Go often. The merchandise is literally always changing and the store and racks will look slightly different every time you go. 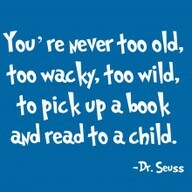 When my little guys were in preschool this past year, I would often stop at Goodwill while I was out running errands. Which leads me to the next tip…..
-Don’t take kids. Sure, you can, and I know some of you don’t get that opportunity very often (especially since it’s summertime!). 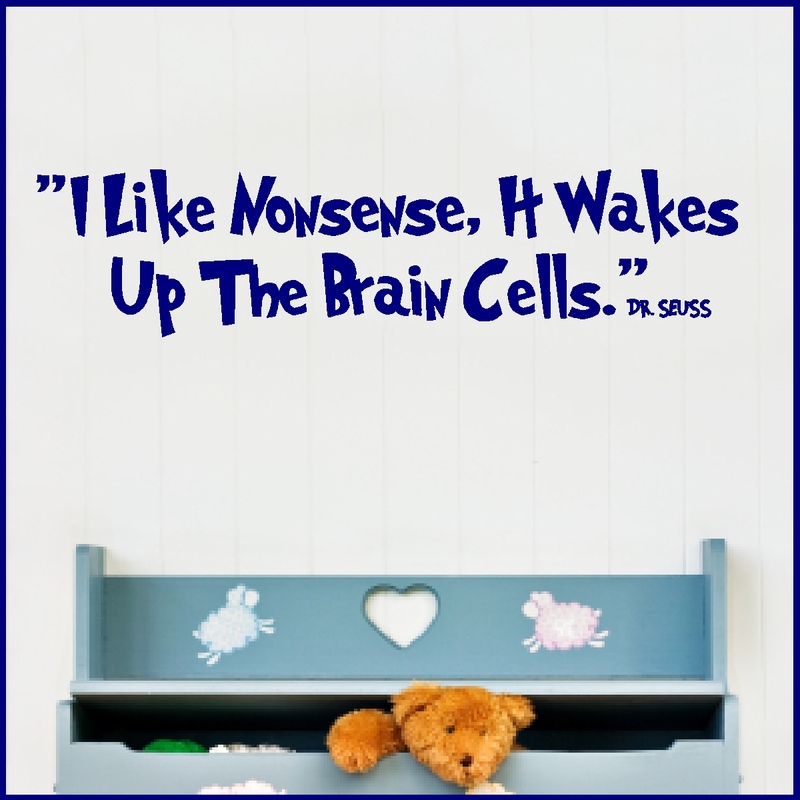 However, all of us Moms know you can actually look at stuff and think about it when you don’t have little people clamoring around you. -Know what you already have. 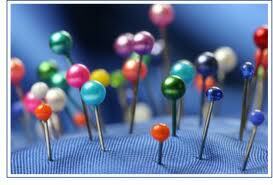 Take a mental inventory of what’s in your wardrobe and think of what will work with what you have already own. Also, you don’t need to buy another pink sweater if you have one sitting in a drawer at home. 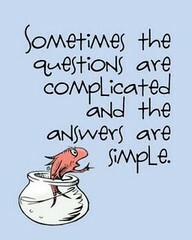 -Have a plan in mind. I usually have something sort of specific in mind when I go. 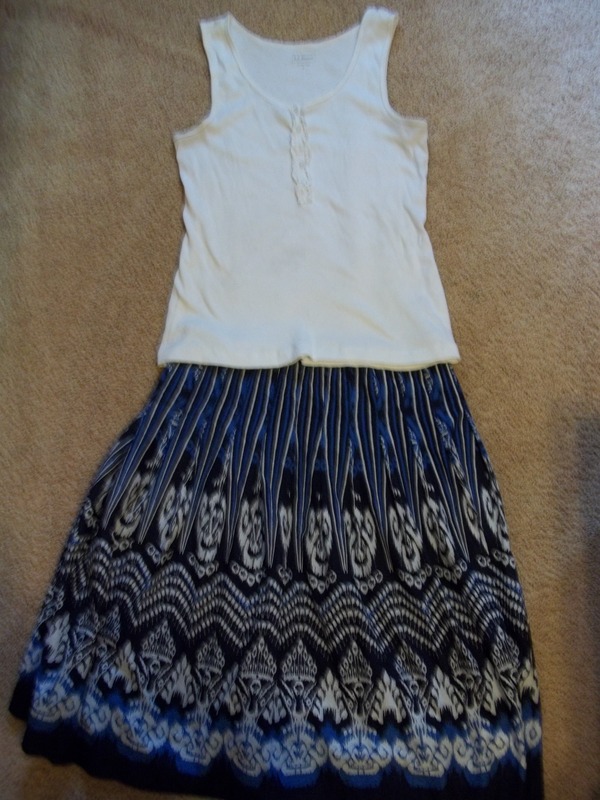 For example, the day that I bought the blue and white skirt pictured previously? I went into the store with the intention of finding a swishy, summery skirt, preferably in the blue and white color scheme. I can name many other times I’ve went in with a specific piece in mind and found what I was looking for. Most thrift stores I’ve encountered have their clothing organized by type and color. For example, all green short-sleeved shirts on one rack, pink on another, and so on. -Try things on. I know I’ve been guilty of grabbing something and think to myself that if it doesn’t fit, I’ll just donate it back. After all, it’s a really good deal, right? But I’d rather go home with something that I can actually wear. -Look at washing instructions. I’ve rarely ever been to a dry cleaner and don’t really plan to much in the future. Therefore, if it’s definitely a “dry clean only” piece, I usually put it back on the rack. -Don’t buy just because it’s a bargain. Buy it because it’s something you really love and will wear. If you don’t love it, it will most likely just be taking up real estate in your closet or dresser–even if it was only $2. -Look over everything fully before buying. There’s lots of stuff that gets donated that has broken zippers, is stained, or has other quality issues. 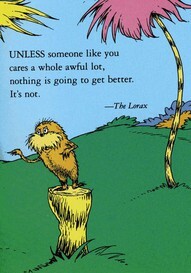 If you’re willing to do the work to fix the problem, then go ahead. Otherwise put it back. 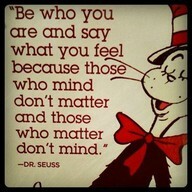 -Keep an open mind. 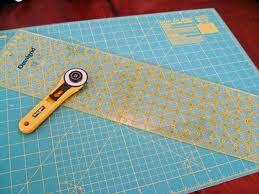 If you or someone you know has some sewing skills, then think of how something can be altered if need be. For example, the dark denim shorts that I fashioned out of too-short pants. I would have never bought those pants if I hadn’t known ahead that I could change the length. -One in, one out. I’m extremely bad at this, so really I’m preaching to myself here. If you buy something new to you, you need to get rid of something. We don’t want to end up as hoarders, now do we? No? I didn’t think do. -Have fun. Thrift shopping may be the last thing you want to do. 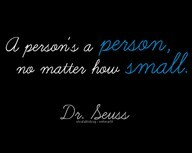 It’s certainly not everyone’s cup of tea! I know lots of people that love it though. 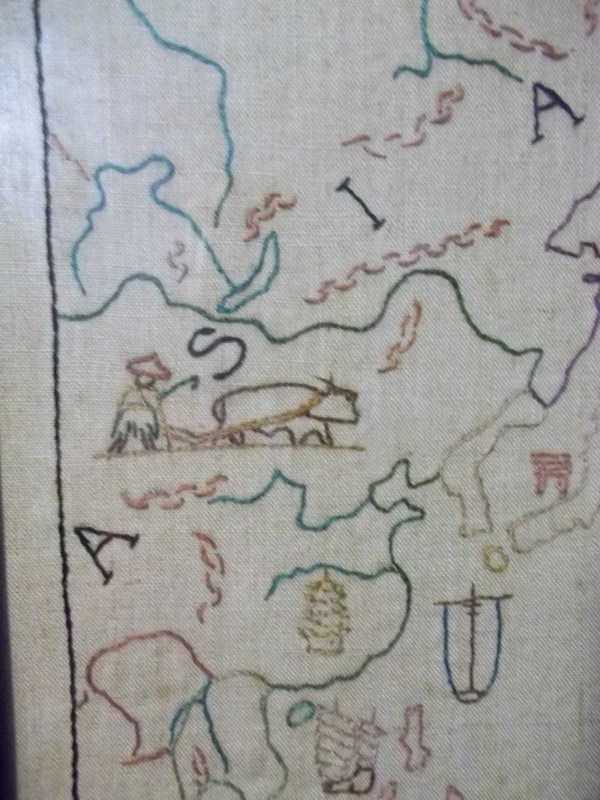 It really is like a little treasure hunt and you never know what you will come across. Sure, you may see lots of stuff that you know why no one wants anymore. (I’ve had some good laughs at some of the clothing I’ve found.) However, there’s tons of good stuff mixed in with the bad. I had a really great find lately at an antique store. 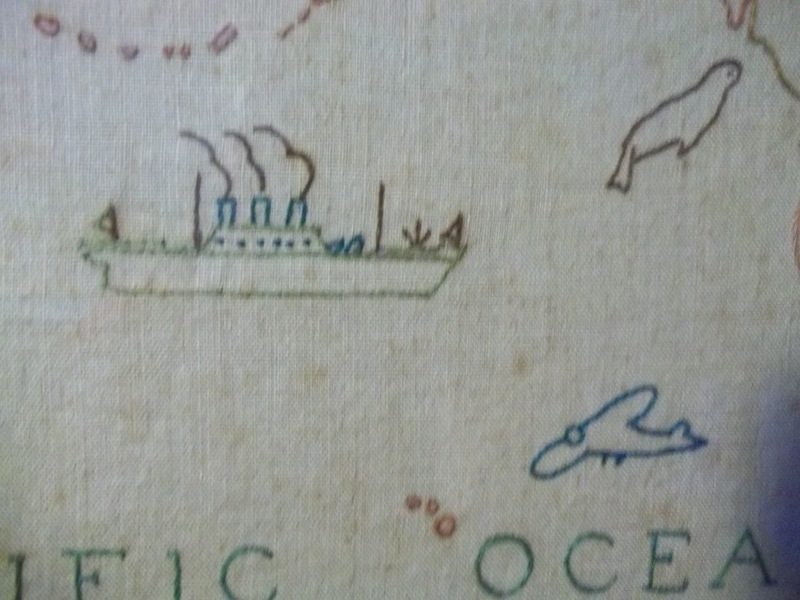 This awesomely detailed world map caught my eye. 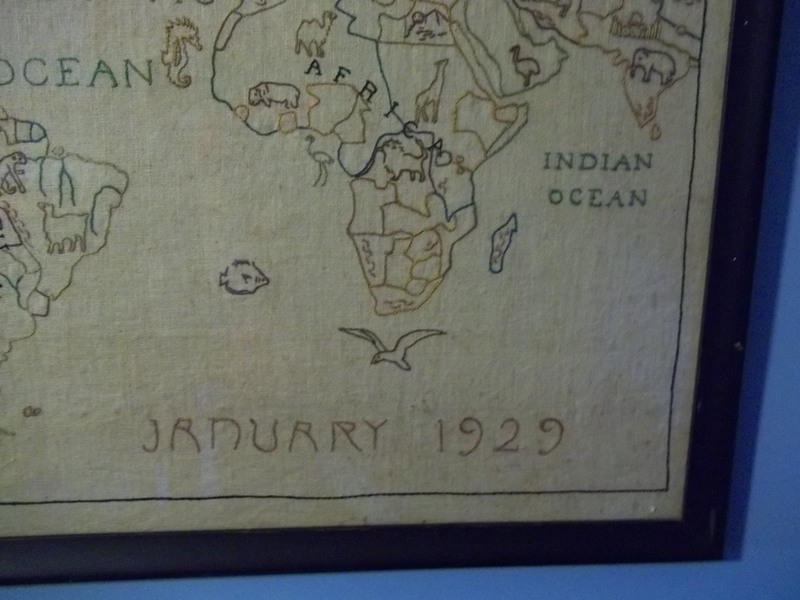 Hand embroidered on linen, framed, and with a 1929 signature. 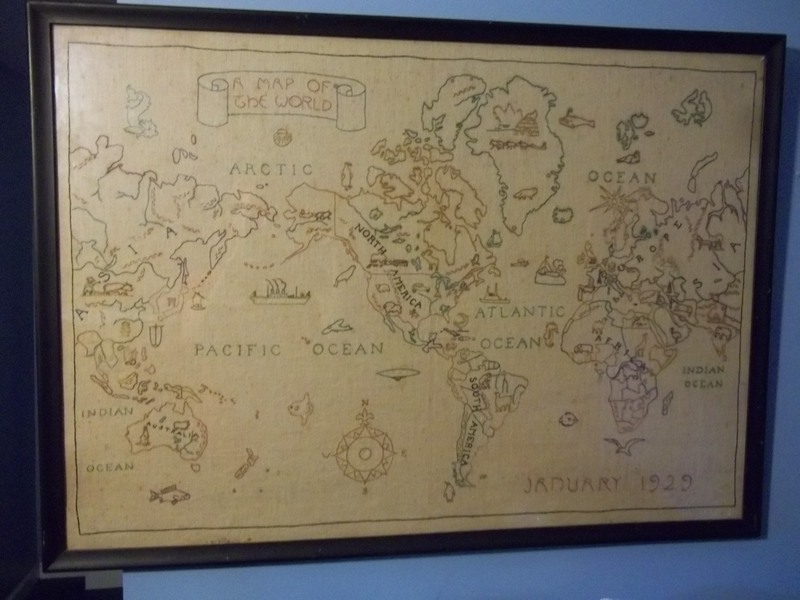 It now resides in my boys’ bedroom, making a really cool addition to their room decor. 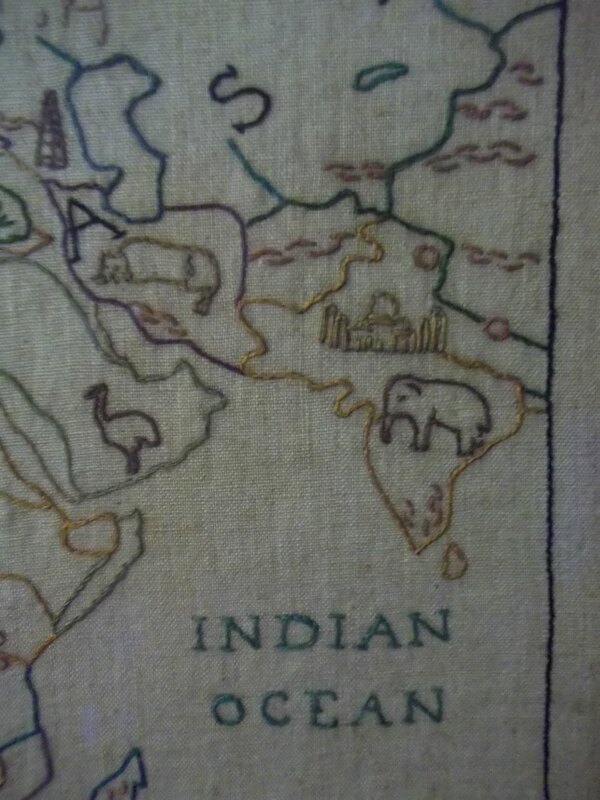 I especially loved the little details sewn in, like this elephant and Taj Mahal embroidered over India. 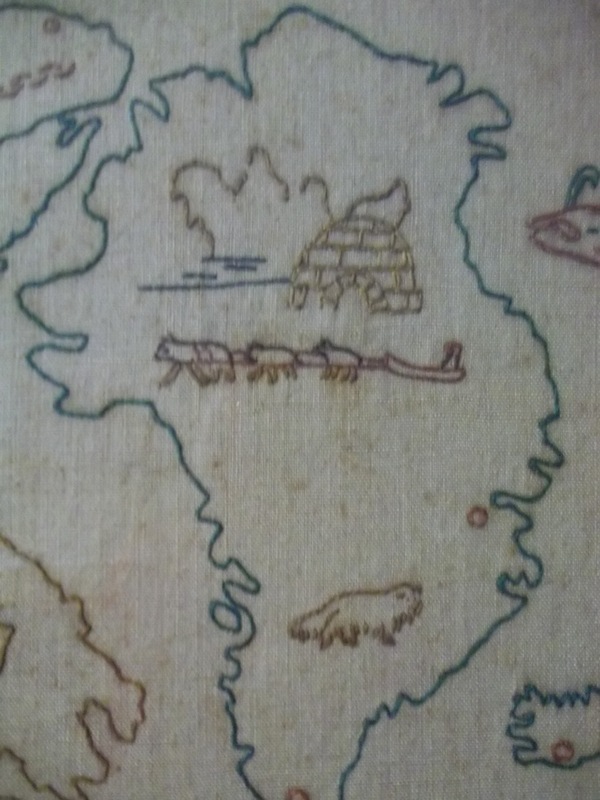 This dogsled team and igloo is one of my favorite features. So many loving details. I can’t imagine how long this took someone to make. 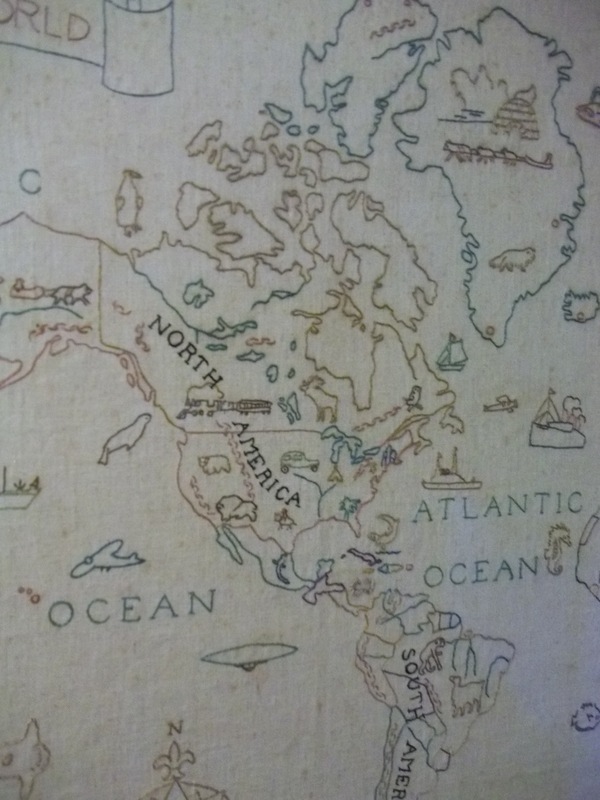 All in all, I’m pleased as punch about my new world map. I love the smell of them, love the taste of them in certain foods, and their yellow color makes me happy. 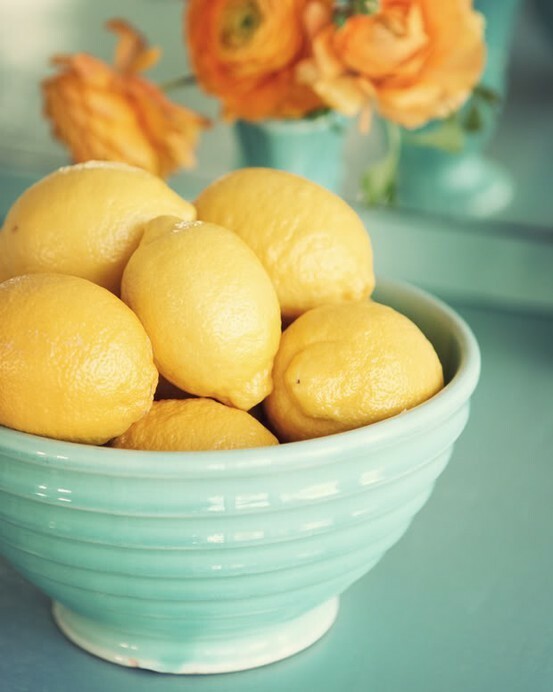 In fact, one of my favorite decor ideas in the spring through summertime is just to have a glass bowl of lemons in the middle of my table. Not mind-blowingly creative, but it always looks fresh and pretty! 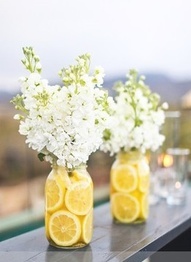 Here’s some other beautiful ideas that I’ve stumbled across using lemons in decor, whether it’s for everyday or for a special event. 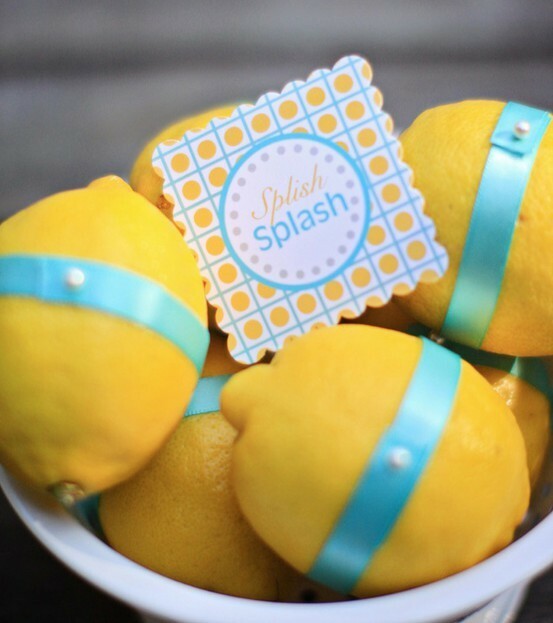 Lemons in a bowl with a blue ribbon tied and pinned around their middles. Photo from blog.amyatlas.com. 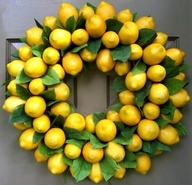 A gorgeous wreath made of lemons. Photo courtesy of creativedecorations.com. 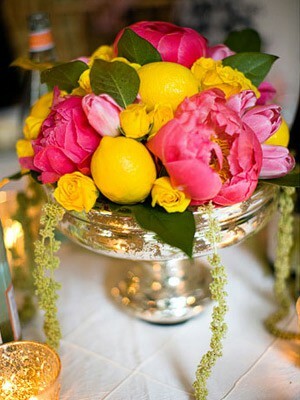 Lemons paired with bright pink blossoms and some greenery make an elegant centerpiece. 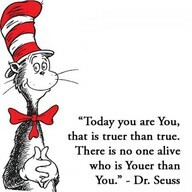 Photo from theknot.com. 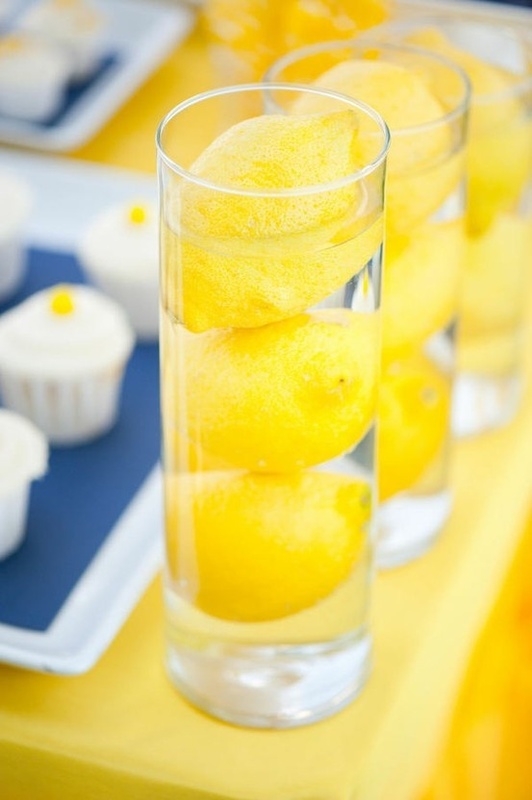 Using lemons as place card holders for a wedding or special event. Other fruits would work nicely too! 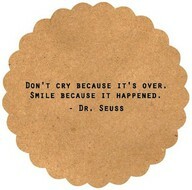 Courtesy of stylemepretty.com. I love the look of these in a simple blue bowl. 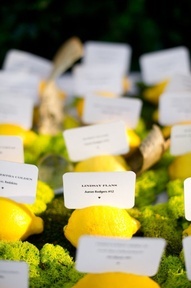 Photo from themeadowbrookblog.blogspot.com. How easy is this? Stack a few in a tall glass and add water. 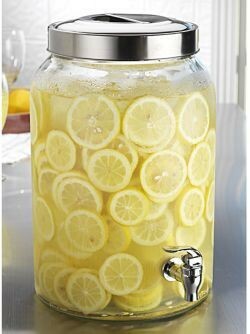 Lastly, since my family loves to make a lot of fresh-squeezed lemonade in the summer (and year round), I had to throw this one in. I would love to have a big ole’ dispenser like that! A Kitchen Aid mixer. I'll admit that for the first ?? 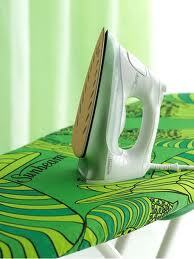 years of my marriage, I hardly used it. Now I use it fairly often and LOVE it. 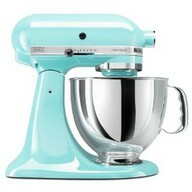 Mine's not this pretty color though, just plain white and stainless steel. 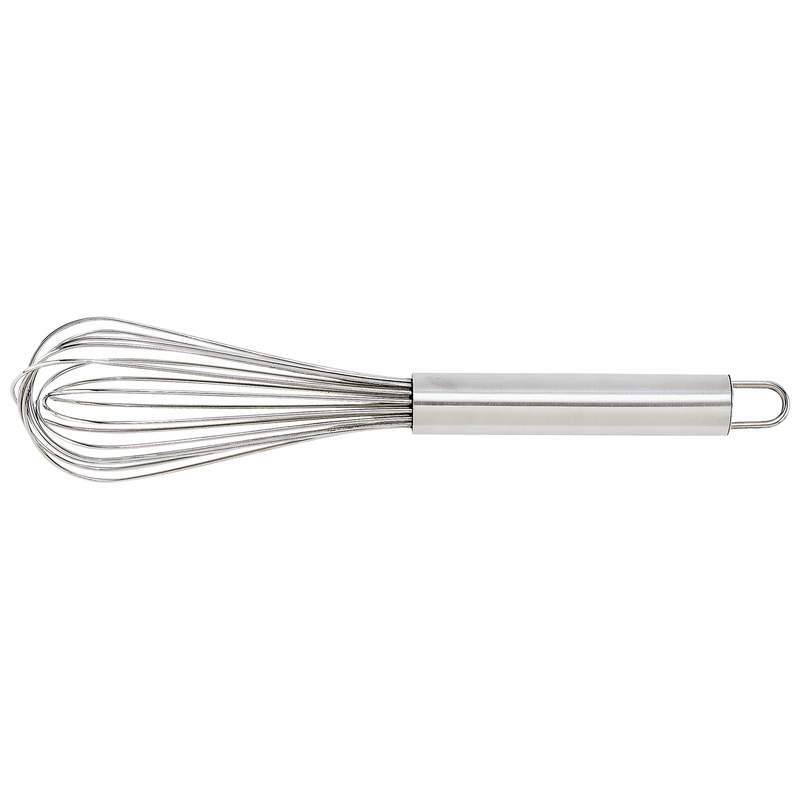 A good wire whisk. 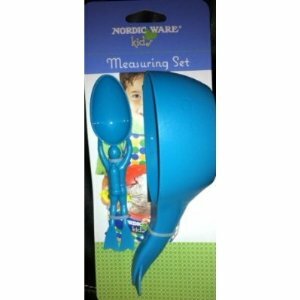 I have two sizes and actually prefer the smaller version to whip things up better. 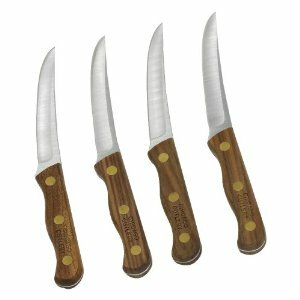 My Chicago Cutlery knives. 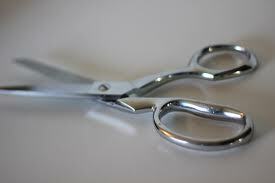 We received some as a wedding gift and I use these about every day. 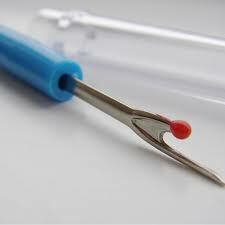 There's a medium-sized one that is pretty much my all purpose knife. 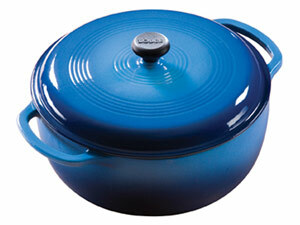 Lodge brand cast iron enameled Dutch Oven. 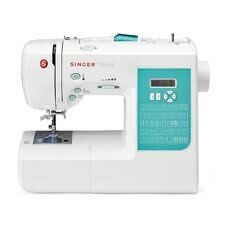 Mine really is this pretty blue color! I received this as a Christmas gift from my husband a couple years ago. 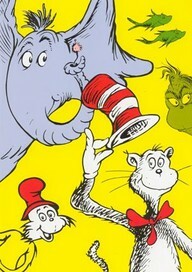 It is wonderful and can be used many ways. Highly recommended!! 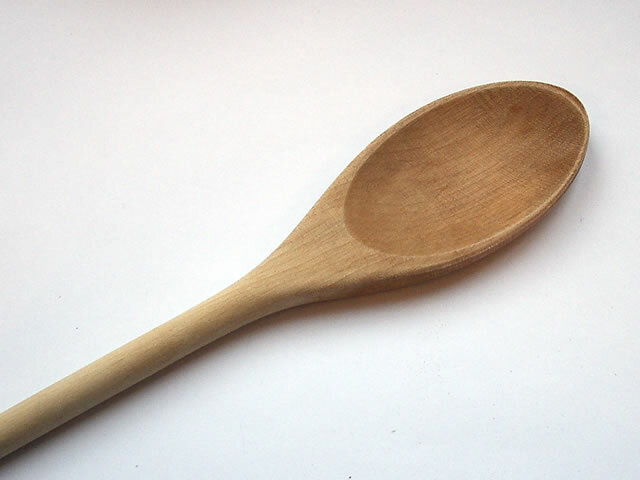 A good wooden spoon (or two). Simple, but I use them all the time. 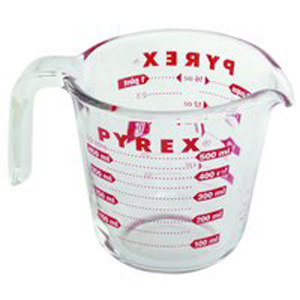 Pyrex liquid measuring cup. I also like to use Pyrex baking pans in all sizes. 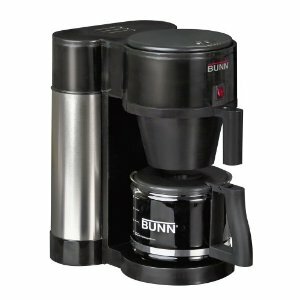 We have an older version of this Bunn Coffee Maker. This lovely workhorse has been a part of our household for almost 13 years and hasn't failed us once, and I can guarantee you that we use this daily! It brews up a nice pot of coffee in a short amount of time. No sir (or ma'am), we're not ready to jump on the Keurig bandwagon anytime soon! Well, that’s my short list. I’m sure there’s other things I would include, but those are the main ones that came to mind. How about you? What kitchen items are your must-haves? Feel free to leave me a comment!